Shoes are designed for specific activities in order to provide the necessary support, fit, and surface to best manage the activity. If you are going hiking, it is extremely important to have the right hiking boots in order to prevent injury and provide your feet the proper support they need to navigate the terrain. What Kind of Hiking Will You Be Doing? • Light Hiking Shoes. These hiking boots look similar to running shoes, but typically have a sturdier exterior. They are perfect for light hiking and are considerably lighter than other hiking boots, which make them ideal for long-distance backpackers. • Backpacking Boots. Backpacking boots are made for the more intense hiker that intends on hiking for multiple days, both on or off the trails. They contain a stiff sole and are made with materials to handle just about any condition. • Mountain Boots. These hiking boots are for those hiking through rocky terrain, snow, or glacial trails. They are built with water-resistant materials and can handle some of the toughest terrain out there. In addition to determining what kind of boots you need for the type of hiking you will be doing, paying attention to the material the boots are made out of is important as well. Some boots are made of synthetic materials, which are lighter and less water-resistant. Other hiking boots are made from what is known as split-grain leather, which is half leather and half synthetic materials. While very breathable, it is not as water-resistant as full-grain leather. Full-grain leather is best for mountain boots and provides the perfect durable material for the rigorous hiker. However, full-grain leather is not as breathable and can leave your feet feeling very hot and uncomfortable. First and foremost, it is important that you find the right fit for your hiking boots. Wearing shoes of any kind in the wrong size can wreak havoc on your feet. Shoes that are too small or too tight can cause a number of problems, including but not limited to, blisters, bunions, hammer toes, corns, and ingrown toenails. For hiking, it is helpful to have thicker socks to help protect your feet. Additionally, your feet may be susceptible to swelling due to the intensity of hiking or weather conditions. 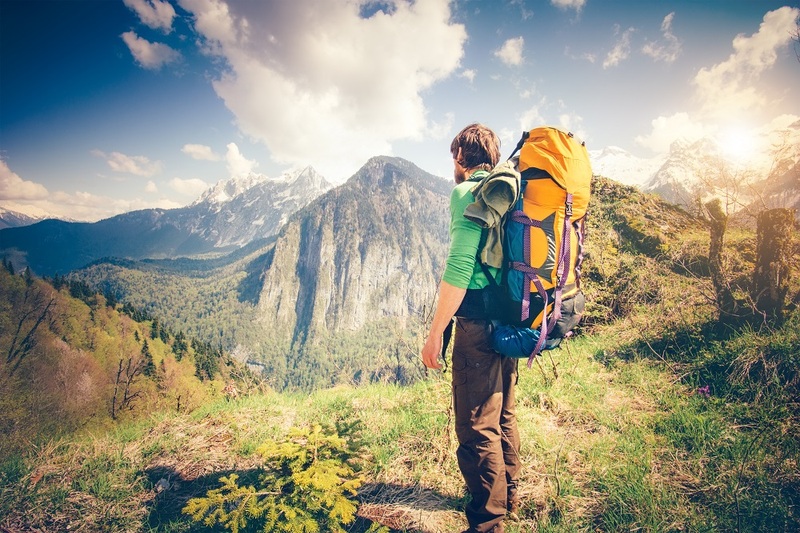 As a result, it is best to buy hiking boots that are a half-size larger than the measurement of your feet. When purchasing hiking boots, speak with a sales associate that can measure your foot and make sure to accurately determine your size. You should have ample wiggle room near your toes for the best fit during hiking. • Get fitted later in the day, when your feet may have some natural swelling from the day. • Wear similar (or the same) type of socks you intend to wear while hiking. • Measure both feet, since sometimes your feet may vary in size. • Check for appropriate fit while standing up as well. In addition to finding the right fit, the cut of the hiking boots is critical. Depending on the kind of hiking that you are doing, your feet and ankle will need more or less support. The lower-cut boots are perfect for flatter and less rigorous trails. The mid-cut and high-cut hiking boots are better for offering better ankle support for the adventurous hiker that wishes to take things off the trail and through rocky terrain. Hiking is an activity that is not an activity that should not be done without proper preparation, particularly when it comes to footwear. Utilizing the above strategies to select the right hiking boots will help avoid injuries that can come from improper footwear. Dr. Kamran Jamshidinia and the rest of his medical team at Jamfeet have been helping patients in and around the greater Los Angeles area to manage and heal foot pain and foot conditions. If you suffer from foot pain, contact us today at (310) 247-9255 or contact us online to schedule your initial consultation.